My compatriots in the blogosphere are far too kind. I've only been posting sporadically this year, owing mostly to the fact that my inherent laziness has come to the fore. 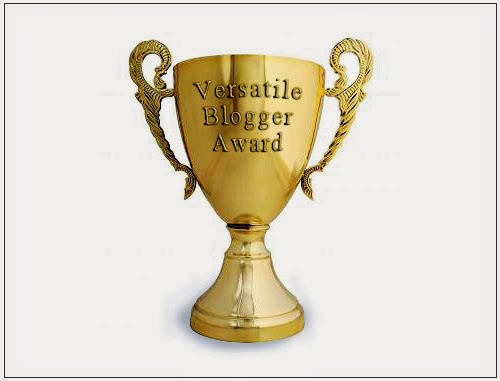 Even so, Barry at Cinematic Catharsis has been kind enough to nominate me for my first Versatile Blogger Award. Thank you, Barry. I feel a bit like I'm accepting an Oscar for not making a movie, but that doesn't make it any less of an honor. I guess it's time for me to quit slacking off and put my nose back to the grindstone. In the spirit of recognizing the hard work of my compatriots, following is a list of my own nominees for the Versatile Blogger Award. All are fine folk whose work I enjoy and appreciate. Join me in supporting them so they'll be inspired to continue doing what they do. You may have noticed there are only eight nominees listed above rather than the traditional ten. I'd feel remiss if I didn't offer a tip of the hat to a couple of sites that have sadly chosen to shutter their doors - The Info Zombie and Blood Sucking Geek. J.D. at Blood Sucking Geek simply decided it was time to call it a day, and Carl moved seamlessly from The Info Zombie to his new concern listed above. Both The Info Zombie and Blood Sucking Geek live on in archival form, and I stand ready to offer my continued support to whatever the future holds for their respective proprietors. I'd close with the traditional "Ten Things You Might Not Know About Me", but I suspect that would be at least nine things more than you'd probably care to know. Continue visiting the Dog Farm, and all shall be revealed in due time. Thanks to everyone for allowing me to be part of this community of talented individuals, and thanks in particular to Barry at Cinematic Catharsis for the nomination. You're definitely worthy, Brandon, and your nomination was long overdue. In lieu of quantity, you have consistently written quality posts, which are a pleasure read. You also have a knack for finding movies that I would have otherwise overlooked. Visiting Movies at Dog Farm is always an education. Congratulations on the nomination! Are we able to vote and stuff some ballot boxes on your behalf? And thank you for the nod, too. While I'm getting my site up and ready, I will be sure to voraciously devour any post you devise. I will be in touch soon with updates about all the happenings. Until then, keep up the amazing work! There's no need for ballot stuffing, Carl. As I understand it, a nomination is the same as a win here. That's good, because I have no campaign platform prepared. I'm enjoying your new site - and it's already an award winner! Yours is one of my favorite new movie blogs, Isaac, and I particularly enjoy your original artwork. Isaac's Haunted Beard is already offering up unique original content, so I look forward to watching your site continue to grow. Congratulations! Thank you, Brandon, for the award! Thank you, Giovanni, for consistently producing such fine content. Congratulations!